2C79 broke down at Nailsea & Backwell this afternoon. Caused a fair bit of disruption to other westbound services. Same again today. This time 2C71 broke down at Yatton. And again a 2-car 150/2 substituted for the evening peak. On both days, two consecutive Taunton to Weston services have been lost - the return working of the train that broke down, and the following delayed service that skipped stations after Highbridge & Burnham to Bristol to make up time. 150001 was on a 2+4 yesterday, sadly Involved in a fatality yesterday evening. The 57s are fairly reliable, we just hear about them every time they fail because of the service they’re hauling! Where’s the discussion and calling for the replacement of the 150 that failed at Bodmin on Sunday, or the one that failed last week on the Looe branch. 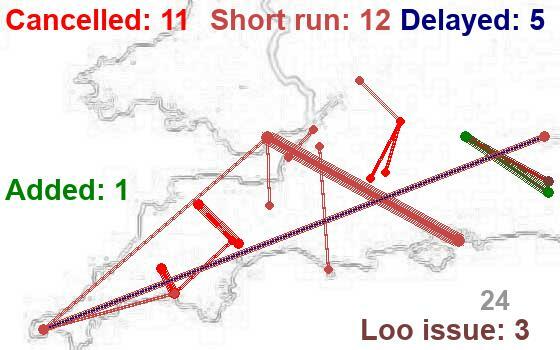 That’s more 150 failures in Cornwall alone in the last week than 57 failures across the network! So presumably requiring being at NQY by 0630. No public transport will get you to the airport anywhere close to that early. The first bus to the airport from Newquay is just before 0900 departing Newquay bus station, and that’s if you can get to Newquay in time for it. Public transport links to Newquay airport is poor, but as a regular driver of 1/6 of the daily bus services from Newquay to airport I rarely drop or pick up at the airport so can see why the links are poor. This occurrence just demonstrates the level of intelligence of some individuals. Putting a device to disrupt a circuit on a line with axle counters. Ironically weren’t axle counters an EU thing? The deceased also appears to have had internal knowledge. The person who died was indeed a member of railway staff. A very sad day: may I offer our condolences from this forum to his family and friends. Sadly since I made that post i discovered it to be someone I knew of. I’d met him on occasion through friends. Not wishing to speculate but Stoke Cannon is a full barrier level crossing controlled by CCTV from Exeter Panel. So if a car is involved then it must have been a very deliberate action or a very unfortunate set of circumstances just outside the barriers, and that would explain the long line closure. The train involved was one of the GTi sets. The photographs emerging show no damage to the level crossing equipment. I therefore suspect (and its just my own opinion) that the car was driven off the level crossing when the barriers were up, onto the tracks outside of the range of the level crossing CCTV system. Time will tell. I think we were very lucky the train didn't derail as it appears to have pushed the car nearly half a mile along the track before coming to rest. Your theory is identical to mine! Looks like it’s being linked to various other incidents in Devon involving the railway this morning. Police have confirmed a man in his early 20s died after a car was hit by a train in Devon on Thursday morning. British Transport Police say a 23-year-old man from Exeter was pronounced dead at the scene at a level crossing in Stoke Canon on Thursday morning. Set La26 involved 0600 Exeter st David’s to Bristol Parkway. I’ve just read the 2+4 slam door sets operated today have been allocated as class 257. I haven’t seen reference to this until a few minutes ago!